Learning about intervals on guitar is probably the most impactful music concept I’ve learned. It took my understanding of scales and chords to a whole new level. In fact, it made such an impact on me I would consider it to be one of the most important music concepts to understand. Let’s see why. An interval is the distance between any two pitches. On the guitar, these distances are measured by frets, or semitones. 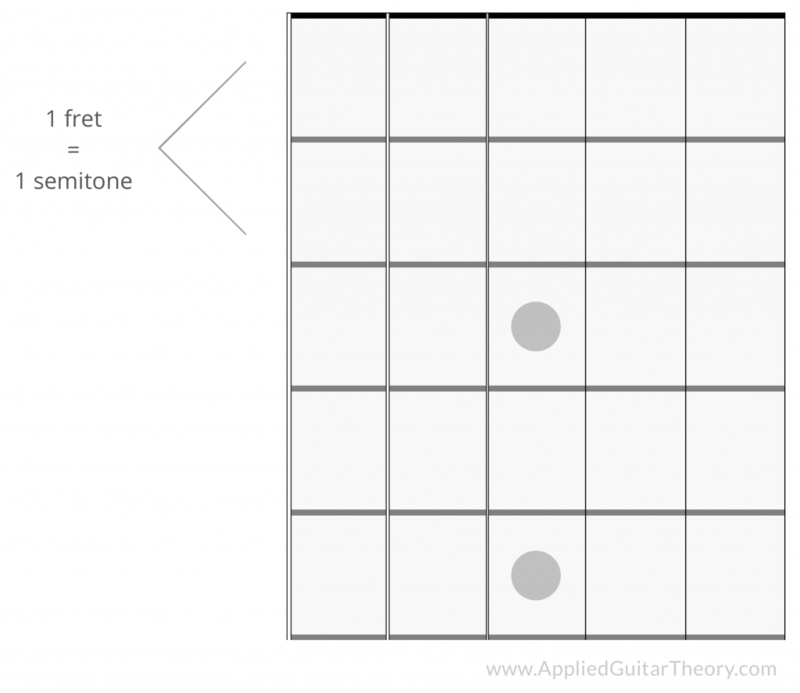 One fret is equal to one semitone. In the table below are the intervals for the chromatic scale. The diagram below outlines the intervals on the guitar for the chromatic scale with F as the root note. It’s important to note that these intervals aren’t static, but relative to the root note. For instance, if G was the root note, then on the 6th string 3rd fret would be the perfect unison (P1), 4th fret minor 2nd (m2), 5th fret major 2nd M2), and so on. It’s also important to understand that although this diagram shows all of the intervals on one string, these intervals exist across the entire fretboard. So you now know what an interval is and how it’s measured, but why is this so useful? Intervals help you to better understand how scales and chords are constructed and how they’re applied to music (ie. which scales to play over which chords, etc.). In this lesson we’re going to focus on scale and chord construction. If you’re not familiar with major and minor scale patterns, I recommend reading The Major Scale and The Natural Minor Scale. You’ll notice that the major and minor scales share four intervals in P1, M2, P4,and P5. However, the minor scale contains three minor intervals in m3, m6, and m7, whereas the major scale contains M3, M6, and M7. Knowing these intervals allows you to construct any scale. For instance, take the harmonic minor scale. The harmonic minor scale is the natural minor scale with a major 7th (M7) interval instead of a minor 7th (m7) interval. If you know the intervals of the minor scale, you know that all you need to do to play the harmonic minor scale is increase the 7th interval by a semitone, or one fret. Since scales are the basis of chord construction, let’s take a look at the role intervals play in creating chords. 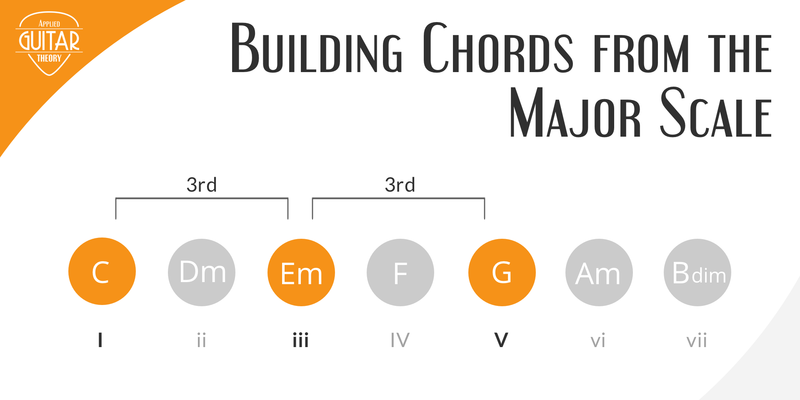 Major and minor chords are built on 1st (root), 3rd, and 5th intervals of their respective scales. 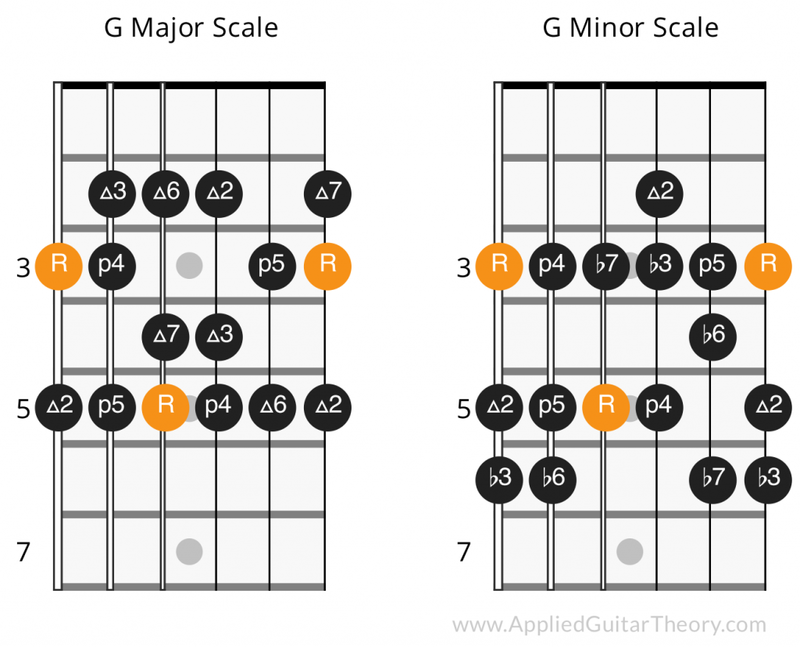 Knowing this, we can take the intervals from these scales and map the chords as shown in the diagram below. This doesn’t just apply to the major and minor chords. It applies to any chord. Notice the familiar barre chord shapes that are formed. These shapes are moveable, meaning you can move them up or down the fretboard to form other chords. You can move a G major barre chord two frets higher and play an A major barre chord, etc. 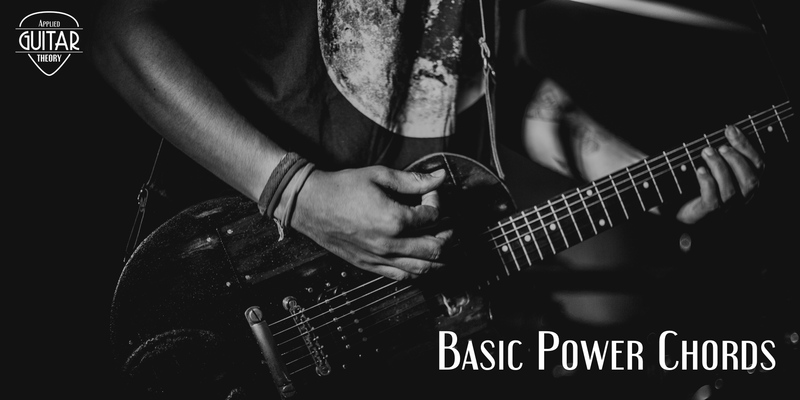 This is because the intervals on guitar are always in the same position relative to the root, which creates learnable patterns across the fretboard. If you move the root note to another fret, the Perfect 5th would still be in the same location relative to the root. A more complete diagram outlining the interval positions can be found in the resources section at the end of this lesson. You should now understand what intervals are and how they are applied to the guitar. The importance of knowing the intervals on guitar can’t be overstated. It not only allows you to better understand scale and chord construction, but also gives you a deeper understanding of how music works in general.